The puris swam in the sweltering hot kadhai while the Aloo Sabzi was being hastily filled in the ‘dunas’ ( bowls made from leaves). In any corner of Varanasi, this breakfast is ubiquitous. No frills, affordable and extremely filling. Occasionally accompanied with stuffed kachoris ( deep fried, and with a pinch of hing) and downed with sweet lassi, frothy with cream of course. In the adjacent shop, a pot bellied man is on an auto mode: frying jalebis and transferring them in the sugar syrup. There isn’t any dearth of them in this paan stained street. I fetch my tiny diary where I have meticulously listed over a 100 must eats in my 3 day visit to this spiritual city, famed for street food. Determined to try as many as I can, I set out on my food exploration in one of India’s oldest city. Spiced with hing ( asafoetida) , choti kachoris near Jaipuria are a hit with the locals. Another breakfast favourite is the “Sabzi Kachori”. Budhiya Ki Kachori at Ravinder gate has people waiting every morning for their share of Kaddu Ki Sabzi and deep fried kachoris served with jalebis. Paan and Paan stains are ubiquitous in Varanasi. It is difficult to find a person without a Paan in his mouth. In fact, it is said that because they constantly chewed on their paan while talking, a newer dialect emerged. The winner for me was the Meetha paan made with love and served with stories near the Chowk area. This distant cousin of Rabri and doppelgänger of lassi is available in the wee hours of the morning and vanishes in a couple of hours. Served in earthen kulhads, this is cream which is whipped endlessly. The ones with a sweet tooth will love this. But if you strained your milk to get rid of the malai as a kid (like me), you’d probably skip this one. Another option is the Bhaang lassi! Read all about the Bhaang Lassi of Varanasi as tried by Lost with Purpose! Deena chaat bhandaar or Kashi chaat bhandaar? I keep asking locals and the score is always 50-50. At the end of the day, you can go to any, because to be honest I was disappointed by both. Maybe because I went with very high expectations or maybe I kept comparing it with the street food of Amritsar. The famous Tamatar chaat is mashed tomatoes with spices and condiments. ( At Deena chaat, the guy even put gulab jamun sugar syrup in it). There are a host of other chaat items too. Tokri, aloo Tikki, Bhalla papdi and the likes and sweet meats like Falooda kulfi and Gulab Jamun. I hopped in at Taj Ganges gateway to try the famous Satvik Thali at The Varuna restaurant. To my utter dismay, the restaurant was reserved for a group. As I turned to go, the manager asked me if I would like to sample the local cuisine at the coffee shop. He actually offered to serve dishes from Varuna’s kitchen. Delighted, I sat down to have what turned out to be my most memorable meal at Varanasi. After a tiresome search for Banarasi local cuisine, I finally find it served with heartfelt hospitality and a genuine will to serve. Chef Dubey dished out the very unique Nimona ( a vegetable made of green peas) served with boiled rice and the local red chilly pickle. Another speciality is the Dum Aloo Banarasi, accompanied with set curd in kulhads ( melt in the mouth) and piping hot Tawa paranthas. The meal is homely and flavoursome and conversations with Chef Dubey make it totally worth the visit. The Gateway promotes the concept of home chefs. Two housewives whip magic in the kitchen, bringing their secret recipes to the world. One such delicacy was Phirni. The icing on the cake was the ‘Malai Peda’, ( I downed 4 of these). Everything about this place is commendable. My stomach and me can rave endlessly, it is truly truly recommended. I am going again. Next time for the Satvik Thali! When all the street food finally gets to you and you start getting home food sick, head straight to Jaipuria. The simple, unpretentious setting welcomes you as you sit cross legged, in front of a massive steel thali. The food is homely, not over the top but extremely tasty. Full marks to their hygiene and quantity. It is a guest house which offers food service to outsiders too. While you are at the Chowk area, do not miss the umpteen varieties of Local murabas to carry back home. My favourite was the baans ka muraba ( bamboo muraba). Another favourite is the aam papad. The streets of Varanasi have a host of Mukhwaas options. Bottles of colourful saunf adorn shelves and shopkeepers are more than willing to invite you to taste some. Childhood memories of granny’s bharwi Mirch ka Achaar were relived as I sampled the local red chilly pickle in Varanasi. Pick up a jar at the Vishwanath Galli or the Chowk for nostalgia’s sake. 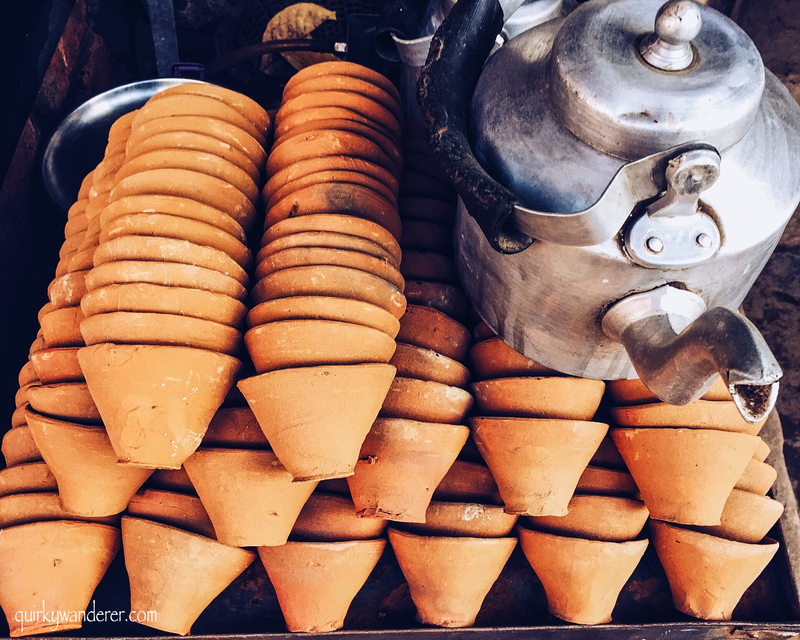 Make sure you get you get your daily dose of Kulhad wali chai on the streets of Varanasi. There’s one at every nook and corner. Get a cup, linger on and a local is bound to catch hold of you to narrate a dozen stories. Have you been to Varanasi? What are your favourite eateries? Would love to know! Ok, so I am heading to stop my stomach from grumbling…comments later ! hahaha! 😀 Sorry didn’t mean to! I have been to most of the places ,my favourites are Banaras chat Bandar close to Gadoliya chowk, thali at jaipuria, rabri, thandai and mukhwas. Just want to add one thing, if you are looking for south Indian food ….Kerala cafe , belapur is best. I am drooling over all this. I just want to have those jalebis, even aloo poori would be a great delight. Chana puri Halwa: the ultimate ashtami prashaad 🙂 <3 Love it and eagerly wait for Navratri because of it! I am glad it did Anindita 😀 Tamatar ki chaat is a Banarasi local dish! Beautiful pictures, Divyakshi. Especially loved the Jalebis and colourful saunf; both something I have weakness for. And the write up is pretty good too. Just a suggestion if you don’t mind – have you thought about maybe using a slider within the post for the the images? Thanks a lot Sid. I am looking for a slider for the pics. Coz my posts are heavily loaded with pics. Any suggestions? Thanks Atul. I loved Nimona. Chefs at Taj serve house dishes through home chefs:) I love that concept! Hi! That is a lot of food, but I did not try all 🙂 The ice cream looking sweet is actually not ice cream 😀 It’s made of milk cream! The list you have compiled up is really amazing. Those puris, kachoris and Malaiyo looks too heavy to digest. I will love trying those chaats for sure. And yes I can purchase saunfs, churans and aam papads. They are my husbands favorite. The pics are so tempting. Kaddu ki sabji and puri is a regular on my Sunday breakfast menu. I have only heard about Varanasi during our class in Indian Literature. I don’t have any idea about Indian foods. Thanks to this blog post of yours that I get acquainted on them even I am not yet visiting India. I would love to try some of those most specially the sweet ones. Yum yum yum! I can almost taste the food through your photos! I’ve never heard of this place before but India is on my list of places to visit and I will certainly be checking out Varanasi! Hope you get to visit India Jodie! It has something for everyone 🙂 Thanks for dropping by! Flavors and more flavours…Varanasi street food is to be tasted at least once…even though in mini portions. Just be careful how much you have at one time. Thanks Rashmi 🙂 Glad you liked it! There is just so much Variety in Indian food, that the techniques change in every 100 kms 🙂 thanks for reading! How can you torture us like this with your yummilicious pictures?!!! I would be confused what to eat and what not to eat! Each and every item looks delicious. You dove right in to the food, clearly, going very local and not holding back. I’m not familiar with Varanasi food at all, so this is quite a good guide. I only recognize some of the Hindi words for the ingredients, not the dishes, and so appreciate the walk-through. The best stories are collected when you adorn the shoes of a local right? 🙂 Thanks Tom! Let me know if you need any help on Indian food 🙂 Will be happy to help! You brought back pleasant memories of a few days stay in Varanasi. Mornings used to start with chai in Kullads, can still smell the fragrance of the earthen kullads mingled with the flavour of tea. The morning breakfast was a sacred ritual of offering oneself Jalebis oozing with sugar syrup and Kachoris, smoking hot from the frying pan. a Banarasi Pan was a nightcapOh! those were the days ! Glad they did! 🙂 Thanks Chandrika! Quite a good list of mouth-watery foods here. BTW when I was there last time, it seemed I have missed many enticing foods to eat. I only remember myself eating Pooris and Jalebi besides some thalis. Thanks. Have to try few in next visit. You have been to Varanasi? how was your experience? 🙂 Thanks for reading Sherab! Such an awesome food guide. Good job, Divyakshi. Thanks Niranjan 🙂 Glad you liked it! Hehe 🙂 So could you resist it? 😉 May is a bad time for food experiments. Totally agree. Glad you liked the post! You MUST! 🙂 Thanks Anks 🙂 Glad you liked it! These Varanasi dishes look absolutely delicious. You have photographed them in such detail my mouth is watering! I’m officially incredibly hungry now, thanks! 🙂 This is a thorough and captivating guide, cheers! My saliva glands are in full operation! Oh, it all looks so delicious! Maliyo caught my eye immediately, even though didn’t know where to look first here. You have some great photos in the post that made me crave these dishes! 🙂 Thanks! Thanks a lot Rupam. Glad you liked it! Nice post on the different foods of Varanasi.. I had assumed the food to be yummy as is the case in most of India. i would dive right in for the Kachoris. That’s something hard to find where I am now. Divyakshi, its dinner time right now and I’m hungry and reading your post is one of the most depressing things to do right now, lolz!!! I want that Tamatar chaat for main course right now followed by Jalebi for dessert! I admire your food pics always. You have shown a world of food from a place where I have never been to! Good that you got to eat that local cuisine at Taj Ganges. hahaha! 🙂 You must do a food walk when you visit it. I just love street food! The malayio looks amazing. When I was in Thailand last year, I ate a ton of street food and everything was so good. Thanks for sharing such awesome pictures! Street food actually gives the real essence of a place 🙂 Thanks for reading Maggie! I must confess, I know Varanasi, but not a lot about Indian food, apart from the most famous dishes we know in Europe and Australia. I think 90 % of the dishes you showed us ar unfamiliar for us, but most of them look absolutely delicious! Love all the colourful mukhwaas ! I just loved your post! Your pictures reminded me of my local food hunt in Rajasthan, where I got to taste some of the best dishes on the streets. I think your disclaimer applies to the whole of Indian street food – directly proportional to the risks you take! I want the kachoris and jamun!! They are all delicious. I would be interested to have a food tour and sample each one of these. The ‘Malaiyo’ looks like an ice cream. I would definitely want to eat that. This function has been disabled for Quirky Wanderer.